Passion doesn’t imply throwing your job and start making crafts and arts or photography as your goal. This type of passion will not end up in any business or money earning factors. Passion means infusing some inspiration in your job or business which will keep you going happily. Following your passion for work or a concrete hobby will help you display your nature gifted talent. It will allow you to gain skills and will make you push yourself deep into your job to become better and gradually the best in your field. If you want to know when you are ready to follow your passion, just watch out whether you are fulfilling your basic needs such as food, clothing and shelter along with a happy family. Finding passion in life is very important part as it helps us in many kinds. The following mentioned are few tips on finding your passion in life and how to discover your passion. The way you feel about your work decides the level of concentration you can put on it. Since you like what you are doing, you will try to make it sure that each and every thing is 100 % perfect. You will treat even the minute details with utmost care and efficiency and you will not like to mark even a single speck on your work just because of silly mistakes. Since you are passionate about work, you will feel happy getting up in the morning and will look forward to go to your work place. You will not have to wander mindlessly. You will put on more concentration on your work because your main aim will be to get successful results and not for any monetary benefits or constraints. When you work for money and demands, you realize that one after another the demands are keep coming and you are leading yourself to an endless cycle. You are now no longer left with the spirit of ambitions or goals for your career. You start hating you job more each day. People do feel that they should work hard in present to enjoy in future. But, my point is what is the use of making your life miserable today for a fake hope of a secured future? Every industry has a busy season which no one can avoid. But since you devote your passion in work, you will be willing to stay long and longer to complete the task. Working late will not sound like a burden to you as well as your family because when you retire, you are still fresh and energetic of the satisfaction you have received from working late but fruitful. The experience become enjoyable and you tackle the busy seasons easier than others. In times of busy schedules, you may be required to work above and beyond your duties. You may be required to perform certain tasks not in your daily schedule. In such cases, it is much easier for you to accept willingly as you like to do whatever you are doing. When you are passionate about something, you strive harder to overcome the hurdle and obstacles in order to complete the task. Your one and only goal is accomplishing the task and you develop a habit of not entertaining any obstacles or hindrances which come across. No one can dare to stop you from it. Your passion will ignite your power like a rocket and accelerates it so that any unwanted situations are fought off with creative solutions. Working 8 hours a day and 5 days a week at something which makes you miserable is not a way of living life. If you enjoy each moment of your work, you will find new aspects of working and you will yourself feel that it could have been different once you had started liking what you are doing. Unless you are born rich enough with a silver spoon, you will have to work throughout your life to make your ends meet. So it is very essential to love what you do to make your life smooth and happiest. Once you finally make it, you will realize the value of fulfillment. The feeling of fulfillment is greater than achieving success as you are proud that you have reached their successfully. Without passion you will not have energy and without energy you will have nothing. So to accomplish something great in this world you will have to develop a passion to your interests you are having in certain things. 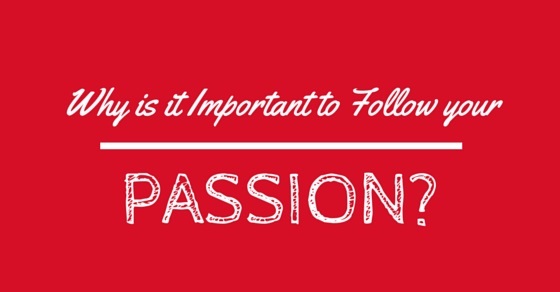 This passion will motivate you to restore your career and success will definitely follow you. Pursuing your passion will make you develop your skills and will come forward as a gift which will lead to expertise. When you are assigned an area of job in which you are interested naturally, more and more people will seek out to your ideas and knowledge due to your expertise and you will get opportunities in a countless form. Once you are fully fledged and energetically inclined to move ahead with passion, the world comes forward to you to bring new opportunities. Along with motivation and excitement, you will feel that all over the world, you have the rights to conquer at our interest level. In your old days, you do not need to look backward as you have worked with grace throughout your life. You shall only sit and enjoy the legacy you have created while you were on the field. You feel happy that you have lived a satisfied life and the younger generation is getting advantages from the passion and expertise you have developed. You thoroughly check your work and when you are up to date, you don’t hold any unreasonable preconceived convictions or adverse judgments just out of lack of facts. You don’t incline to hurt anyone detrimentally by judgment or an act because you yourself are accustomed to honesty and fairness in your work. With the passion you develop an air of honesty and strictness around you which no one dares to disturb on the ground of non acceptance. Creativity is developing wings to carry you from above the cliffs. Imagination and creativity is developed with passion. It is the preview of the coming attraction in your life. It demands courage to be creative in a successful manner. It leads you to move forward and opening up new doors and doing new things out of curiosity. Curiosity leads to new paths. Passion is anything which gets your blood racing. You have to be prepared to work hard and sacrifice. Remember one thing that the road to success is too difficult to navigate without burning desire from within. Passion is one great force which makes you willing to take great risks. Working on something with immense pleasure shows a type of confidence you have gained while at work. The work with passion will make you feel confident and daring to overcome any situation with great self esteem and confidence in your attitude. It’s about the Inspiration, impact and influence one has on others. Passion about your job will leave a trail of satisfaction in you. What you have within is the contentment with your life and when you are content with your life you can stay happily with your family and friends. They will not have to go through your grudges and sadness in your professional front. Your end result should be such that you should have a feeling of inspiring people. At the end of the day, when you hear from someone that” I didn’t give up –and the reason was you!” It creates a heavenly feeling. You feel that your purpose for life has been met. Come alive and do your part because this is what the world needs-people who have the fire in them to come alive. Life is short and youth is indefinite. You have to find an intersection point of your passion and potential for a positive impact. The only thing is you should be ready for adventure. Only then will success come to you. You will have to restrict the attraction of fame and money traveling to your mind and become humble in search of passion and satisfaction.